Taliesin Reid Haugh (Cleveland, OH) grew up in Cleveland’s art community and has danced with Morrison for the last 8 years. His dance experience includes Hawkins style modern dance with YARD under Bill Wade & Leilane Barret, Horton technique and ballet under Michael Medcalf, Stiltwalking and aerial circus techniques with SAFMOD, Breakdance/hiphop with the Chosen Few crew & Ground FX, rooted deeply in 20 years of Afro-Brazilian Capoeira with Groupo Narahari, founded by Mestre Beicola. Taliesin has practiced abroad extensively, sometimes as a member of UNESCO’s Conseil International de la Dance. After earning his B.A. in Anthropology from Cleveland State University, he enrolled in a Master’s program in Sustainable Development, focusing on nonprofit management, renewable/alternative materials design, and agroecology. 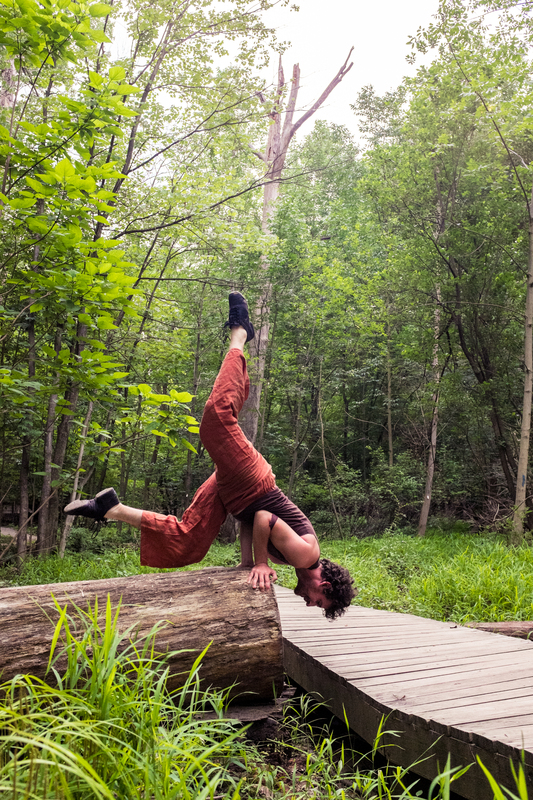 When not dancing, Taliesin is co-managing a sustainable education garden in Vermont, teaching Capoeira, studying history or climbing something.